It seems evident that we will want to focus on keeping Britain within the EU and fighting for an “Exit from Brexit” in the EU elections that seem almost certain to take place. However, this cannot be the sole reason we fight these elections. The elections are an opportunity to sell our vision of what we want the UK’s future relationship with the EU to be. For example, there are numerous policy debates to be had going forward about how we can shape the future of the EU to be better. Given the closeness of the 2016 referendum, it would be foolish to assume that all remain voters align with our way of thinking and all leavers align with Nigel Farage et al. Many “soft” leave voters who plugged for leave on the day can be won round to the European argument. However, this can only be done by offering meaningful reform and selling an open, transparent and liberal vision of Europe. Likewise, if we go for full throttled pro-Europeanism that is afraid to constructively criticise the EU to reform it, we will alienate the reluctant remainers who plugged for remain as a lesser of two evils. We must seek the middle ground, be a force for remaining and reforming the EU. There are several areas I would like to see us champion going into the European elections. There is an urgent need for us to rework our approach to justice in the EU. Whilst Europol and the maintaining of our place in the European Arrest Warrant, are brilliant achievements, there is more we must do. We must continue to campaign to ensure that the arrest warrant is not misused for petty crimes. Another of these is the successful and timely completion of the EU/Mercosur (Argentina, Brazil, Paraguay & Venezuela) free trade deal. One of the key tenants of liberalism is freedom from poverty. We have long recognised the ability of free trade mixed with a strong international development program to alleviate poverty. The completion of the Mercosur/EU trade agreement will allow us to trade and build relations with nations in South America which has the potential to increase international stability and use our soft power as a bloc to force leaders such as Brazilian President Bolsonaro to treat the LGBT+ community with respect. Additionally, there is a pressing need to ensure that the right to a fair trial is at the heart of EU justice policy. This key pinnacle of western justice must be underpinning any shared competencies in the form of justice policy. When any European citizen is accused of a crime, they should be automatically eligible for initial legal advice free at the point of use. This is crucial because in the area of cross boarder crime, there is no EU legislation on the area and there is a reliance on the goodwill and legislative frameworks of individual member states. It was the EU and Liberal Democrats that led the way with proportional elections in the European Parliament. We fought with Labour and the Tories to secure this. We must now press for greater legislative power for MEPs as well as directly elected Commission and Council Presidents. If we focus on being the reforming, liberal voice for the EU promoting equal rights, free trade and democratic reform, then we could not only bring on board our natural voter base, but also stretch out into liberal leavers who wish to see a reforming party. 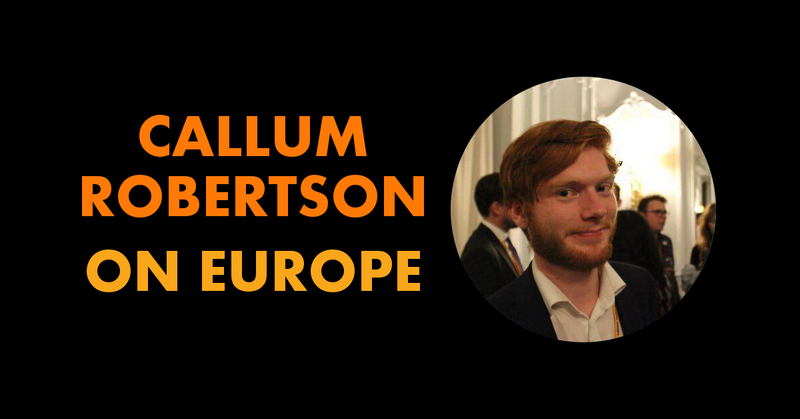 Callum Robertson is a board member of Liberal Reform, PPC for Clacton, and is standing for selection to the East of England EU Parliament Elections list.